In hockey a backhand shot is very important. Some players such as Mats Sundin, Patrick Kane, Evengi Malkin, and Sidney Crosby are known for having powerful backhand shots. Sidney Crosby is said to use a flatter curve on his stick (as did Doug Gilmour) which does help with backhand shots. A powerful backhand shot gives you more opportunities to score goals. You will not always have time to switch to your forehand and shoot. Sometimes a quick forehand to backhand deke is the perfect way to beat the goalie. One more advantage of a backhand shot is that many goalies find backhanders hard to read, making it difficult for the goalie to stop the puck. Here is another video I did with step by step instructions for taking a powerful backhand shot. The backhand is the perfect shot when you are cutting in front of the net and the puck is on your backhand, or when you are deking. Many players deke to their backhand and shoot, only to have the puck stopped by the goalies pad. A player with a good backhand shot will be able to shoot the puck over the goalies pad (or top shelf )and score more goals. A backhand shot can also be useful when you need to shoot the puck quickly (no time to move to your forehand and shoot). There are many times when you should use a backhand, or need to have a powerful backhand shot in order to score. By following the tips below, and a lot of practice, you should be able to perfect your backhand and score more goals! The first step is to draw the puck back in your stance. If you are cutting in front of the net then you will be drawing the puck to your leg furthest from the net (see picture) If you are skating towards the net then you will be bringing the puck to your backhand side and pulling it back slightly. It is a bit easier to take a powerful backhand shot when you are cutting in front of the net because you have more room to draw the puck back and put power on your shot. When you are skating towards the net you almost have to cross your hands over and do not have much room to draw the puck back and build power. In the first frame the blade of the stick has shifted in order to move the puck to the top right (players perspective) corner of the net, this is just before the player shoots the puck. In the next frame the player is starting to shoot. You can see his right arm has come down, and his left arm is pulling the stick towards the net. With a wrist shot you will let the puck roll off the toe of your stick, however with a back hand shot this is not the case. Most blades (unless you have a flat blade) have a curve on the forehand, this means that when shooting a backhand shot, the curve is in the wrong direction. For this reason it is important to release the puck from the middle of the blade of the stick. Try to keep the puck on the flat spot of the blade (between the heel and middle of the blade) If the puck reaches the toe it will reduce your accuracy and power. 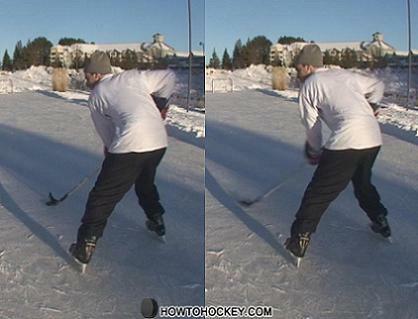 In the final stage of the shot (just after the puck comes off the ice) you will add a snap of the wrists to give the shot a little more power. With a powerful backhand you will also roll your hands over to aim the shot (sort of like a snap and roll combined). This means that the palm of the hand that is lowest on the stick will be pointing up, and the palm of the hand on the top of the stick will be pointing down. Writing out every step of a backhand shot makes it sound difficult and complicated, but the entire shot should take less then a second to perform. You can also check out our video on how to take a backhand in hockey which is embedded in the article above. The player has completed the shot, shooting the puck top right. It is important to follow through with your shot, and just as with a wrist shot, point at where you want the puck to go. Follow through high for high shots, low for low shots. If the player were shooting from further away he would roll his wrists more, and the palm of his left hand would end up facing up. The most important way to get a more powerful backhand shot is to practice. 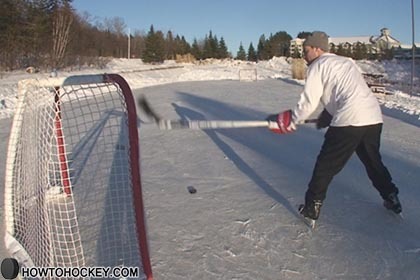 If you have trouble getting the puck off of the ice, practice with a lighter puck so you can get your technique down. If you already can perform a backhand shot then try using a weighted puck. This will strengthen the muscles used to take the shot, and once you go back to using a regular puck it will seem a lot easier to shoot. If you enjoyed this article then keep an eye out for my next article. “How to backhand top shelf” this article will show you how get the puck up high when you are in close to the net. You can also subscribe to my articles in the box to the left, this means the articles will get sent to your inbox whenever they are posted to the site. Thanks for reading and feel free to leave comments in the box below.